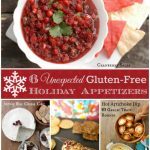 Home » Appetizers » Cranberry Salsa: an Easy Holiday Appetizer You’ll Love! 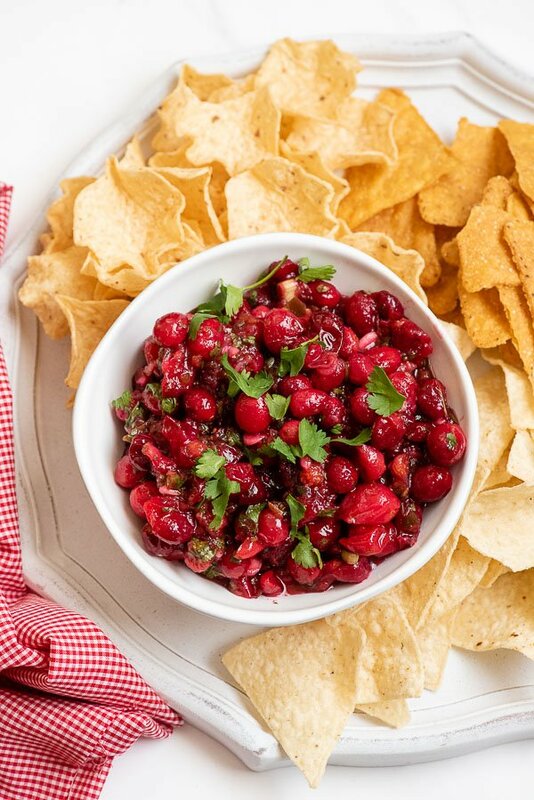 Cranberry Salsa is a fun, seasonal twist on traditional salsa perfect for the holidays! Easy to make and gobble up! The availability of cranberries is always exciting! Just in time for delicious homemade cranberry sauce for Thanksgiving or whimsical holiday recipes like sugared cranberries. 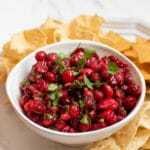 I always am on the lookout for the first bags of cranberries for another favorite recipe: Cranberry Salsa. Homemade salsa is very easy and delicious to make but change it up with fresh cranberries? You have an easy appetizer to impress. 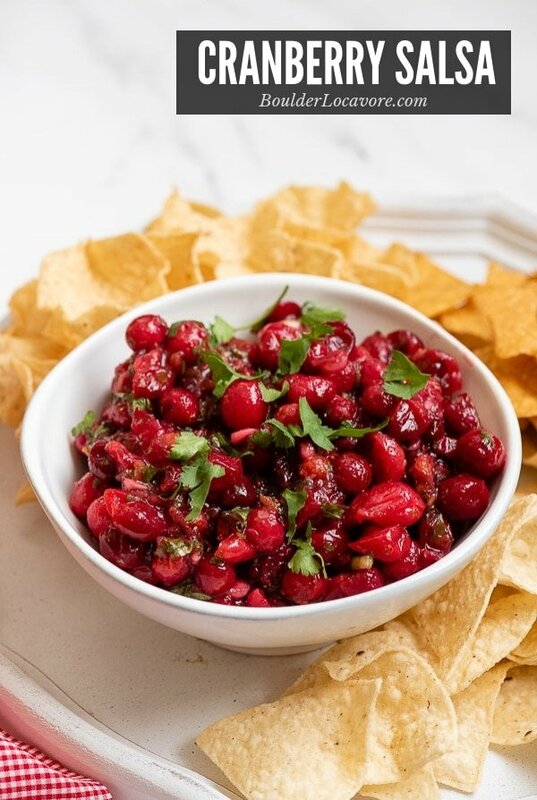 Cranberry Salsa is a dip recipe using the classic ingredients in salsas (jalapeno peppers, lime juice, cilantro, garlic, onion) and swapping the traditional tomatoes with cranberries! 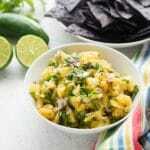 Some sugar is also added creating a spicy, tangy, sweet salsa that is a holiday favorite. Is Cranberry Salsa Easy to Make? It’s incredibly easy and fast! 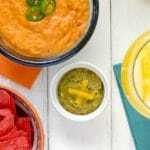 After the salsa is made it can be eaten immediately or chilled in the refrigerator to allow the flavors to blend and the consistency to thicken. It’s a perfect appetizer to have around all through the holiday season. Put the garlic and seeded jalapeno peppers in a mini chopper to dice. Put the limes in the microwave for 10 seconds before juicing and use a handheld juicer OR use good quality bottled fresh lime juice. 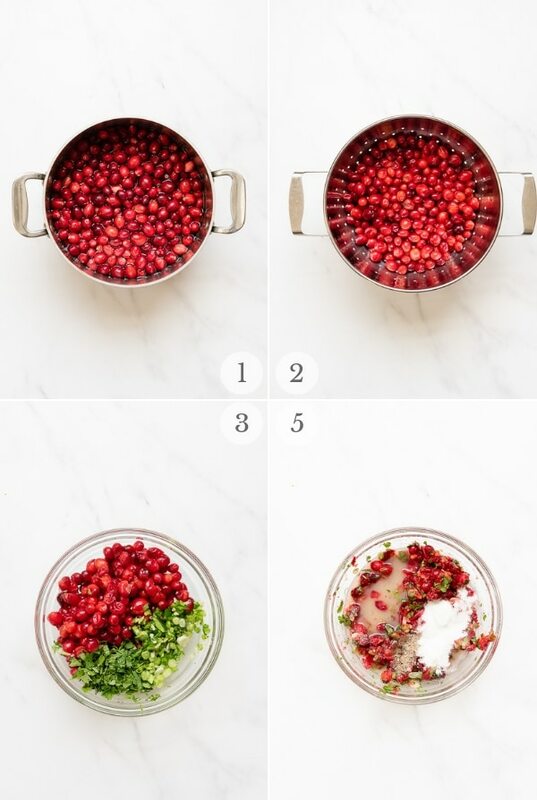 Want to Make Cranberry Salsa Other Times of the Year? Cranberry season is mid-September through mid-November yearly. MY TIP: Buy some extra bags, put them in a larger freezer zipper top bag and throw them in the freezer. Then you can make cranberry salsa all year! The seeds create much of the heat in peppers so removing them dials it back a bit while still retaining the flavor and some spiciness. 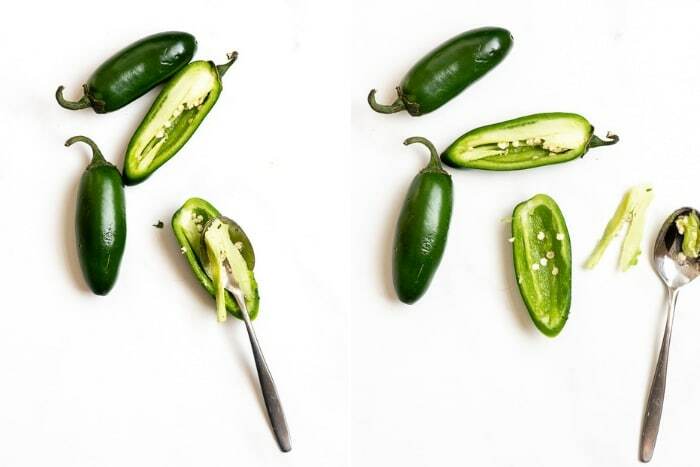 At the tip of the pepper, insert the rounded end of a small dining spoon underneath the white membrane and seeds of the pepper keep the back of the spoon flush with the inside wall of the pepper. Push the spoon up toward the stem end of the pepper, releasing the membrane and seeds. Turn the spoon over and using the pointed end again scrape out (and discard) and remaining seeds. NOTE OF CAUTION when working with any peppers: the oils from the peppers can remain on hands after cutting or touching the peppers even with handwashing. In turn if you touch your eyes or nose, you’ll feel a burning sensation. Wash hands thoroughly after handling peppers or wear some food safe gloves (rubber, vinyl, latex) when handling hot peppers. What to Dip in Cranberry Salsa? 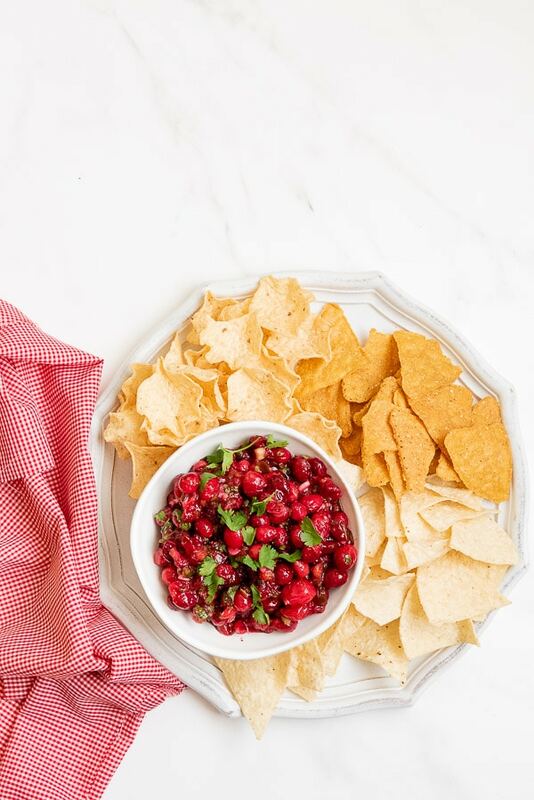 Just like other salsas, tortilla chips are a win with Cranberry Salsa too. I love finding colorful chips to serve guests when they come over. Also, for a lean dipper, try some slices of jicama! It has a light sweet flavor and great crunch! Cranberry salsa is easy to whip up, making it a perfect holiday appetizer! After a quick 1-minute boiling, some of the cranberries will have ‘popped’ or split, others will be whole. Bring to a boil for 1 minute (do not overcook). Some of the cranberries with pop (you’ll hear it) or split. Using a large spoon, stir the ingredients together, smashing some of the cranberries in the process (leave the rest whole). 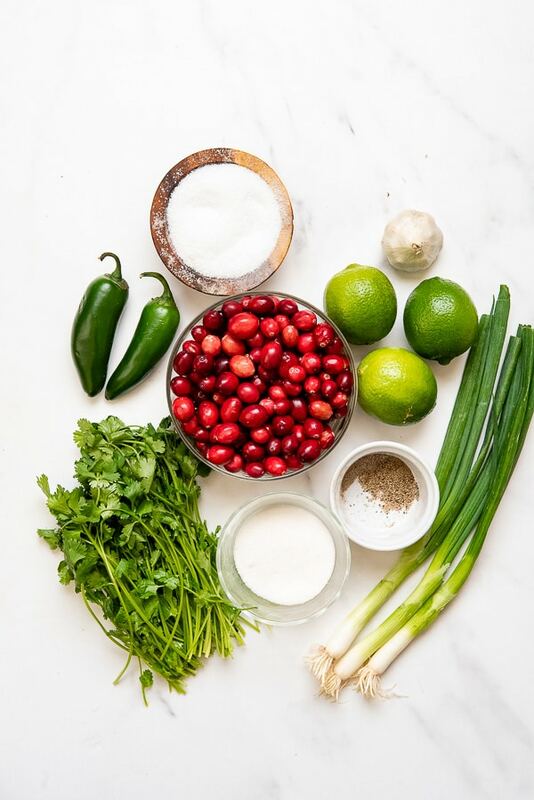 If you’ve made this Cranberry Salsa recipe please RATE THE RECIPE below! The varied flavors and seasonality of this salsa make it truly unique. So many types of tortilla chips are available these days. For my presentation I included red corn and white corn chips for the holidays. 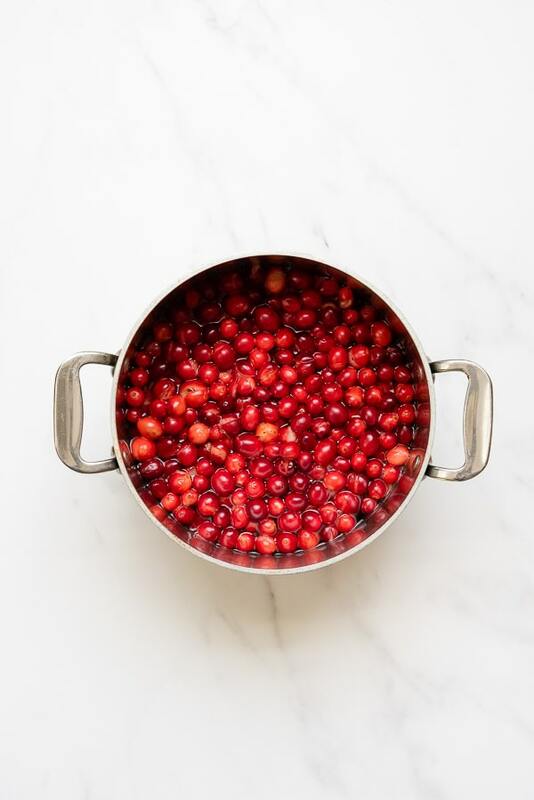 Combine cranberries and 1 quart of water in a sauce pan over medium-high heat. Bring to a boil and boil for one minute. Cranberries will begin to pop; do not over cook. Drain. In a mixing bowl combine the garlic, jalapeno, cilantro, scallions and cranberries. Mix by hand, squeezing some of the berries to a pulp and leaving the rest whole. Add lime juice, sugar and salt and pepper to taste. 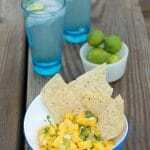 Serve with colorful tortilla chips or thin slices of peeled jicama. Everyone in my house LOVES salsa, this is going to be a hit! I think this is similar to something we had last year at Christmas. It was delicious. I have never tried to cook with fresh cranberries. I think I’ll try this recipe, it sounds amazing. Toni, I think my New Mexico friends would love for me to bring this dip to a Thanksgiving pot luck, and my Idaho friends would think it very New Mexican of me to make it for them when I visit at Christmas. And they’ll never guess it originated in Boulder Colorado … I love the red and green colors together and the flavor promises to be outstanding, especially with salty chips. Thank you for this inspiring and novel idea. I’ve been looking for a good cranberry salsa. This is delicious! I have never tried to eat this but this recipe looks so delicious and the steps look so easy to follow. I hope I will able to make this on this coming weekends.